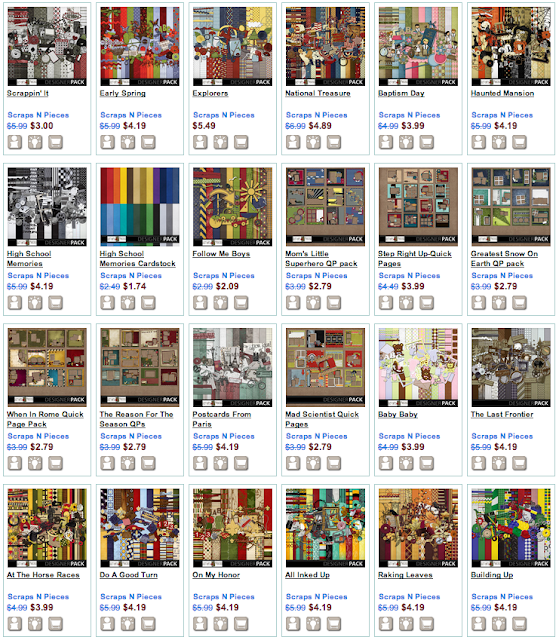 MyMemories Blog: Meet this Week's Featured Designer - it's *Scraps N Pieces*! Meet this Week's Featured Designer - it's *Scraps N Pieces*! Happy Monday and WELCOME to the MyMemories Blog!! We are super excited to announce the new Featured MyMemories Designer!! This week it's "Scraps N Pieces"!! They have some amazing goodies in their shop and some AWESOME sales this week during their feature! Scraps N Pieces is actually two designers, Heidi and Lori. We are sisters, with Heidi being the artist, and Lori being the one that keeps us organized and on track. Our kits are unique because Heidi hand draws many of our themed elements. We both have 3 teenagers and great husbands who support us wholeheartedly in our designing adventures. It has been fun to create together. So be sure to hop on over to their shop at MyMemories and check out all their awesome kits!! Comment below and let them know YOUR favorite!! TEN Lucky Ducks will each win a $50.00 shopping spree to their shop!! How about that??? So get your comment posted today! Winners posted next Monday! Be sure to check out ALL their Social Media pages - they have SO much going on! I LOVE everything in your shop!!! My two favorites are..."Baptism Day" and "Spring Picnics." You are both very talented!!! I have so many favorites! All is Well and Nothin' but Net are two I really like. Thanks for the generous giveaway! I would love to win $50 worth of your designs! Thank You For This Awesome & Generous Giveaway! & Thanks So Much For The Chance To Win! Love the Haunted Mansion and Mad Scientist. I love Mom's Little Superhero! So cute! I found wonderful fun and ideas on every page! I love the Hook, Line, and Sinker, along with Cinco de Mayo and Imagine. Thanks for the chance to join the fun. Love ALL of your kits! ONE favorite would be National Treasure but it is hard to pick just one. Abby is my all-time favorite scrapbook kit. I think it will be my favorite forever! I LOVE SNP's kits!! To pick a favorite is hard, today I think it will be ... Abby and Explorers. Thanks for the chance! My favorite is Building Up for my LEGOs pictures! How awesome! Thank you for the chance to win! I love the Football themed kit and the Raking the leaves kit. I love the "raking up leaves" kit! It is so cute! I really like "You Play Like a Girl" with this kit I would be able to scrap all my pictures of when I played sports when I was younger and of my girls soccer team that I have now. It would be wonderful. You Ladies do a great job!!! Love all the kits! What a beautiful shop to be had so much yummy eye candy. Picking a fave for Are you ready for some football;) Thanks for offering up such a wonderful prize. Your shop is great! I love You Play Like A Girl! LOVE LOVE LOVE your stuff. My favorite are Abby and Sophistichic. But I droll every time you guys come out with something new! :) Thank you for the chance! I definitely need Postcards from Paris for my daughter's France trip next summer. I really like Country Christmas! I love and own so many of your fabulous kits! Sophistichic is one of my all-time favorites ever :) Thanks so much for such a wonderful give-away opportunity! I love Racking Leaves, Make a Splash and all the QP kits and of course I love them all!!!! Thanks so much for the entry and all the freebies that you give away! Love the Orient! Thank you for the chance! Baby Baby is so fun! Heidi and Lori... I have a number of your kits and one of my favourites is 'Cowboy Up'. I just love it. One that I don't have but is on my "need to have list" is 'The Reason For The Season'. I love it too. Thanks for the chance to win. on my honor would be perfect for me to do both my boys scouting pics. especially my eagle. Love all of the kits, but my favorite right now is Haunted Mansion! thanks so much for the super prizes and chance to win! Love all your kits but my favorites would have to be Cinco de Mayo, Wish I Were a Fish and Cowboy Up. I have made lots of fun pages with those. Such generosity, thank you! I absolutely love All Inked Up and You Play Like a Girl. The colors are fantastic! My all time favourite (so far) has to be Abby. It has become one of my go to kits, as it works well for everything. I have to say, I love your quickpages, especially the nightgames one. I also love You Play Like a Girl for my little softball player! Thanks for the chance to win! I love love love Mad Scientist! So perfect for pictures of my students! Love it! "Building Up" is fantastic as my husband loves to build with Lego and our one year old daughter's favorite toys are her MegaBloks. Thanks! I Love Your Store!...I Actually Own Several Of Your Kits ! Would I Love To Own Some More! Thank You For This Awesome and Generous Giveaway! Thanks So Much For The Chance To Win! Raking leaves and Building Up are pretty cool looking. Wow, they're being very generous! My favorite is Postcadrs from Paris. I really like alot in your store but Postcards from Paris really popped out for me! Love all your kits - especially Mad Scientist and Little Explorers! I love the postcard from Paris..I am French Canadian so it is close to my heart!!! Nice giveaway, thank you for the chance! I have been enjoying my Scraps N Pieces items I received as part of the Scrapping Fairytales design challenge. Thank you so much! I was jut looking through my wish list and notices that most of the stuff I want comes from your store. I just LOVE your designs. My kids and I go on a road trip every summer- it's our plan to visit every single state and in it, do something that is unique to that state. Last summer we finished state #40! We see a lot of historical places and a lot of natural sites, so... I love National Treasure! I also was awed by "Proud to be an American"... such great elements!!! oh my so hard to choose! I have and love Abby, it is so versatile! As fora kit I don't have, I really like Sophistichic. Thanks for the chance to win such a great giveaway! I love The Last Frontier!! All of the kits are great though!! Thanks for sharing your story! It means a lot that the pieces are hand drawn too. Great work! I love "wish I were a fish." I like, "a day at the zoo"
I have several of your kits. I like that you have kits for such different occasions, ex. adoption, music, sports, travel, etc. Plus you include so much in your kits that they can be used in so many ways. wow! I love everything on your shop. Love the Space Station and Playing with Cars. I am such a fan of Scraps N Pieces. I would love to win a GC to pick up some of their newest kits, like The Perfect Tree and Scrappin' It. Thank you for the chance! My favorites are Mad Scientist and Imagination! The kits colors and fun elements get the creative juices going! I like a lot of these, but I'll just name Family History-I'm Doing it. "The Last Frontier" is great. I even put it in my cart and bought it, since I have pictures from our Alaska trip this summer I need to finish scrapping. Oh wow what wonderful kits!!! There are so many great ones that I don't know if I can pick just one favorite. I really like the scouting kits you did along with Mad Scientist and Carving Pumpkins. Thank you so much for the chance to win!!! I love the colours in FAMILY HISTORY-I'M DOING IT. There's so much I could scrap with this kit. The AMAZEing pumpkin patch has been my theme for scrapping 18 years of my family owned pumpkin farm! Time is of the essence with so many years to scrap and this pack has made it easy as pumpkin pie!! Would love to win so I can get even more of your great designs!! Ps...the elements of graduation day have worked their way into many of my pages- love it! Keep on designing! Love them all! We have three boys in Scouts, so I LOVE the kits "On My Honor" and "Do a Good Turn." I have so many scouting photos and am working on books to have ready for when each of them reaches Eagle to display at the Court of Honor. Wow, what a generous offer!!!! My favorites are Raking Leaves and The Last Frontier. I am partial to "Nature" kits. Thanks for the chance to win. I love your kits! I especially like the "remembrance" kit. I can't choose just one pack as my favorite. I love the cowboy kit! I use it all the time. I love zoo, playing with cars... see!! I can't choose just one!! love them!! And by the way, I have to say how cool it is that you guys get to work with eachother! Aren't sisters great!! I searched for volleyball kits and found you had the absolute best kits! I made scrapbooks for my 7th grade team (I coach) and they loved it. It was so easy and turned out so dang cute!! Love your work!! I would love to have your remembrance kit. I scrap for remembrance, and I love all of your rich colors in your kits! I have so many things that the remembrance would work with- although I really wish I had more $$ to get more of the kits! I LOVE "The Perfect Tree" kit. I definitely need more Christmas kits. Love so many of your kids that I don't know which to say is my favorite. Have used Happy Birthday Girl and Boy a lot lately for my family album. Love how your kits work for more than just the theme. I recently purchased The Last Frontier and it is my favorite. I guess you can say I'm a "most recent is my favorite" kind of gal. I love all of them. But Born to be Wild is the coolest. I used it recently for a friend's 18 year old nephew. The leather elements look so cool and masculine. Thanks for such neat kits. Love Family History. Hope to work on mine sometime soon. I love all of your kits, and it is really hard to choose a favorite. Of the ones I have, this would be Angel Eyes, I think... And at the very top of my "need to have as soon as possible" list is Mad Scientist. What a fun shop I was just looking at these before I saw the post on the blog. It has been so fun reading what your favorites are ladies. Thanks for all the comments and send your friends over to look through our shop as well. We love our fans! Don't see my previous comment so I will try again. Have many of SNP kits and right now my favorite is The Last Frontier. Having been on many cruises to Alaska it is absolutely beautiful. I would like to take an annual cruise there as it is one of my favorite places....it is breathtaking! It is so difficult to choose but I would say either Digging for Dinosaurs because my grandson loves dinosaurs, Walking in Faith because it has been a real journey since my husband passed away unexpectedly 2 and a half years ago, or We've Got Spirit b/c it would be a great kit for 4th of July pics. I think the kits and quickpages in your store are all awesome. It was fun being at your Scrapbook retreat last year and meeting all of you. I learned a lot at the Retreat. I've used your "Baptism Day" kit and QP's a lot for grandchildren pages. I like the colors and style of your kits. Brooke's quick pages are some of my favorite but I like most of the other QP's in your store. WOW that awesome. LOVE all of your kits. That so difficult to choose one favorite from your store. I love your Bohemian Rhapsody kit so much and also Mad Scientist kit which reminds me of my laboratory work. Thanks a lot for the chance to get your kit. I LOVE Postcards from Paris! Gorgeous! Thank you for the opportunity! I love Postcards from Heaven and Scrappin' It!! My favorites are Remembrance and Sophichic, but since I own both of those the top ones on my wish list are The Last Frontier, Walking in Faith, and Postcards From Paris. I love the Abby Quick Pages Combo. The kits are so gorgeous too. I have haunted mansion and really like the art work. Would really be excited to win this prize. Thanks for the chance to enter! i like the bugs & boys kit. since i have all boys in my family i'm partial to anything related to boys. I really like Reason For The Season! Thanks for the awesome giveaway opportunity!!!! My favorite has to be postcards from Paris. It brings back very happy memories of my trips there. Love All of Your Kits but my Favorite one "On My Honor" I guess because My son and Grandson were and are Boy Scouts and Cub Scouts. Just returned from 18 days in China and can't wait to use THE ORIENT for my scrapbook. Awesome stuff!! I've bought from you two several different times!! All the creations never disappointing kits!! A lot of them i use time and time again! Thanks for the hard work guys!! Keep the awesome kits coming and i'll keep buying! Great work! So many beautiful kits with unique embies. I wish you plenty of sales.